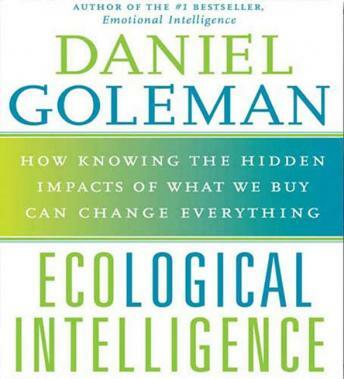 Written By: Prof. Daniel Goleman, PH.D.
Narrated By: Prof. Daniel Goleman, PH.D.
Ecological Intelligence recasts the uproar over global warming and the assault of man-made toxins into our bodies in terms of the collective self-deception which both created this crisis and holds a key to its solution. Ecological Intelligence argues that 'green' labels and recycling programs may do more harm than good by feeding a vital lie, lulling us into the illusion that we are doing enough already while ignoring the adverse impact of the far vaster proportion of what we buy and do. The book brings a psychologist's insights into the world of commerce, arguing for radical transparency -- tracking every substantial impact over the life cycle of an item, from manufacture to daily use, to disposal -- and surfacing those impacts at the point of purchase. The movement toward such transparency augurs a day when the free market will operate in public interest. by Prof. Daniel Goleman, PH.D.